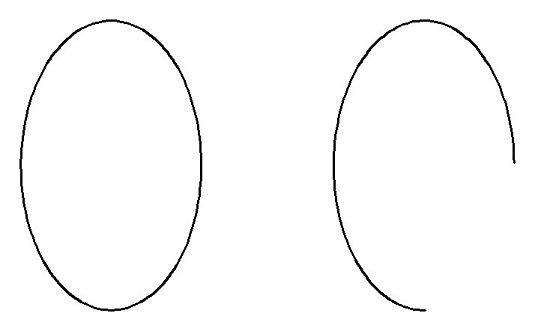 The AutoCAD ELlipse command is easy to use. In case you’ve forgotten your ninth grade math, an ellipse is sort of a squished circle although it may be more accurate to say that a circle is an unsquished ellipse. Please excuse the technical jargon. Mathematically, an ellipse is defined by a major (long) axis and a minor (short) axis. These axes determine the ellipse’s length, width, and degree of curvature. An elliptical arc is an arc cut from an ellipse. Arc: Generates an elliptical arc, not a full ellipse. You define an elliptical arc just as you define a full ellipse. Center: Requires that you define the center of the ellipse and then the endpoint of an axis. You can then either enter the length of the other axis or specify that a rotation around the major axis defines the ellipse. If you choose the latter option, you can enter (or drag the ellipse to) a specific rotation angle for the second axis that, in turn, completely defines the ellipse. Rotation: Specifies an angle that defines the curvature of the ellipse — small angles create wide ellipses (0 degrees creates a circle, in fact), and large angles make thin ellipses. After dinner, when your plate is empty, hold it vertically to look at it straight on. It looks like a circle. Slowly rotate the plate about its vertical axis until you’re looking at it edge-on. Between these two views, you will see every possible ellipse as defined by the rotation angle — and your dinner guests will begin to wonder about you. Here is an ellipse and an elliptical arc. To make an omelet, sometimes you have to break a few ellipses. You can create elliptical arcs (as opposed to the circular arcs that the Arc command draws) by using the Arc option of the ELlipse command; it can draw a respectable representation of a snowball trajectory, neglecting air resistance. Alternatively, you can draw a full ellipse and use the TRim and BReak commands to cut a piece from it.